Shinji Ikari's father is the head of a company called NERV. This company uses giant mecha (called EVAs) to fight against an opposing threat to Earth: Angels. 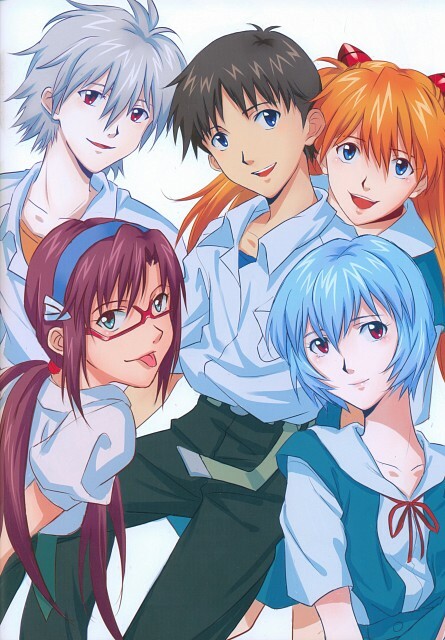 Throughout the 26 episodes and two movies, Shinji teams up with other 14-year-olds his age: Rei Ayanami, the quiet blue-haired girl who pilots Eva 00; Asuka Langley Soryu, the fiery red-headed girl who pilots Eva 02; Kaworu Nagisa, the boy who pilots Eva 03; and Toji Suzuhara, who pilots Eva 04. They all fight to save the world day after day in an epic story with twists and turns throughout the series. Neon Genesis Evangelion isn't for everyone. If you like a good story that is challenging to comprehend, then I recommend you check this one out. But if you like things in black and white, this isn't going to be your cup of tea. It's a good anime, but if it had been a bit easier to understand, it could have been even more succesful than it already is. Neon Genesis Evangelion is a famous and well appreciated anime,revolutionary in so many ways,the series has influenced an artistic and technical revival of the mecha genre.unlike classic giant humanoid robots in previous mecha animes, the Evas are actually cyborgs and can almost be considered as living beings. Their principal purpose is to defend Tokyo-3 from the Angels which are the main menace to humankind. Yes the main antagonists of the series are angels! pretty outrageous when you think of it! (actually,this promethean aspect it's what i like the most about this anime Lol). there's also another original thing i like about The series is it explores the experiences and emotions of Evangelion pilots and members of Nerv through psychoanalytical stuff which make the protagonists more vulnerable,human and.. real. such thing allows the viewer to identify with the characters feelings and personalities quite easily despite being a lil bit too melodramatic and adolescent sometimes. Another favorite series of mine that I put amongst my top 10 favorites of all time, NGE Is a compelling series complete with human drama and moments that would make anyone laugh (especially PenPen related stuff, the look on his face after eating Misato's instant cooking was classic), the Eva battles were a sight to behold, and a great cast of seiyuu voicing the characters. It has a pretty good dub as well. NGE is a classic piece of an anime masterpiece. The Rebuilds to me is a disaster; especially with all the OOC moments, the story being all over the place becoming a nonsensical mess, and developing it into something that is facepalm-worthy. I dislike what they did with Asuka and Misato's characters in the Rebuilds and how it severely reduced the roles of Toji, Kensuke, and Hikari...they're great supporting characters. So, I am reflecting my score on the original series and the EoE only...for the Rebuilds are a disappointment to me. I thought it'll be an epic anime with all the people talking about it on the net and all the high ratings it got but for me it was quite a disappointment. Though Rei ayanami was the only reason I watched the anime. Simply is EVANGELION, in all its fury and structured an almost perfect story, with excellent graphics and soundtrack, from NEON GENESIS EVANGELION with their current films to Rebuild of Evangelion. I saw NEON GENESIS EVANGELION, along with both movies that are DEATH AND REBIRTH and THE END OF EVANGELION seen equally Rebuild of EVANGELION from 1.11 to 3.33 and I'm looking forward to its end. KAWORU NAGISA: This is my wish: please, destroy me. Otherwise, you will be destroyed. Only one life-form can be chose to evade the destruction and seize the future! And you are not the existence which should die. You need the future, it's what you live for! If you like mech anime then this is the show of choice for you. One of the first animes I had seen or started with was this and I really liked it and quite enjoyed the series, but it's hard to remember much about it, since it's been years since I have watched it. Hummm, I dont really understand this anime. I watched it because my friend recomended it. Its very complicated stories. Each characters have their own issues. Not much humor on it. Its more into angst. This mind-crippling anime (that I feared very much during childhood) is my favorite anime of all time starting since 2006. You can get a bunch of mind-blowing stuffs in its storyline. Many religious references also made it so special. In short, this series is so legendary. My favorite show of all time!!! There's so much that can be said about this show; great character development, crazy psychological issues,giant robots!!! This show makes you truly feel connected to the characters and makes you feel for them. This show not only goes into the personal issues of the characters but it also gets into religion and philosophy. Again, hands down my favorite anime OF ALL TIME. i give it the highest recommendation you can give. (warning: this show can get very depressing but it DOES NOT take away from the experience you get from watching this anime). ps: Asuka fan for life!!!!!! One of the best animes out there. The story may be hard to follow for a lot of people but they should not give up. It is crucial to pay close attention to every detail given, especially towards the end. I can't believe I never added that awesome anime (and manga) to my watchlist... Is there really anything to add about this masterpiece that everyone knows already? Let's try anyway. It's one of my favorite anime ever because: the characters are all unique and interesting, and not only the main ones and I liked that; the plot is complicated and full of details making you wonder about your existence and I like when an anime makes you think about yourself; the hero isn't one, he is a human who can fail like everyone else, he has weakness and he is far from perfect. Evangelion is just an anime everyone must see one day! A monster among anime giants! The first time I ever watched was at a friends house and we spent the entire night watching the entire series in one go because we just could not put it away. Great characters, awesome battles, superb setting, and a very intriguing plot that can keep you coming back for more until the end! There isn't much here not to love here, a must watch for any anime fan! The series took some time to grow on me, but overall, I enjoyed it in the end. The second time I watched Evangelion, I was paying more attention to the charcters themselves and their relationships, and then I started to love it. I've seen "Death and Rebirth of Evangelion" and "The End of Evangelion", too. I've finally seen the "Rebuild of Evangelion" movies, and I plan to watch the third and fourth one as well, when they will come out. This is THE most absolutely jaw-dropping anime I have ever seen. The first time I watched the whole thing (which I haven't been able to do again) I got completely depressed. I'm serious. I got so depressed that I just laid in bed for about an hour. It was so shocking.